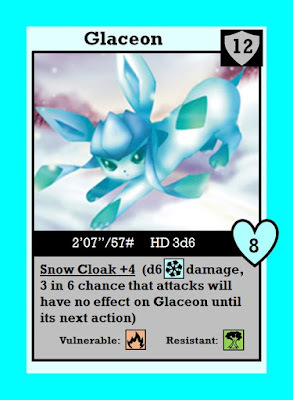 In the lingering holiday rush, I didn't quite hit Monstrous Monday with this post, but I wanted to continue looking at Eeveelutions for old school RPGs by hitting the next two to enter the Pokédex...Glaceon and Leafeon. These two showed up in Generation IV of the Pokémon games, adding Ice- and Grass-types to Eevee's evolved forms. As with all Eeveelutions, they're as cute as they can be. 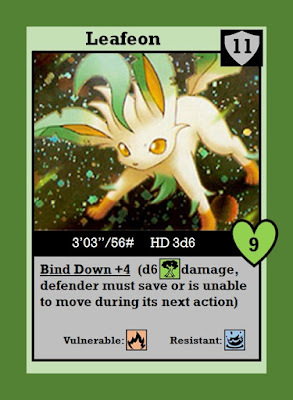 So it basically does not fight, which is pretty cool...oh, I guess except for the times that it's forced to fight in a ridiculous bloodsport by the humans who hold it captive, which is, y'know, the entire point of the Pokémon franchise.